Content by Tony Macklin. Originally published on April 28, 2012 @ tonymacklin.net. Marley is a terrific documentary. It goes beyond one figure, and captures the essence of life itself. Despite its wayward, checkered history - first Marty Scorsese was to direct, then Jonathan Demme - Marley seems to have settled in ideal hands. It's difficult to imagine a director doing a better job with the project than Kevin Macdonald. Macdonald gives masterly sweep and style to his subject. His movie has both great heft and great facility. Marley traces the career and evolution of Bob Marley, the reggae singer who became an international sensation, and a mythic figure of peace and joy. This is not to say that Macdonald shows a saint. Nor does he push the imperfections. He shows glimpses of the ego, drug use, multiple women, and vanity of his subject, but he doesn't get bogged down in them. They are there, but Macdonald transcends exploitation. In Bob Marley, Macdonald captures a competitive, creative, generous, flawed human being - a force of nature. 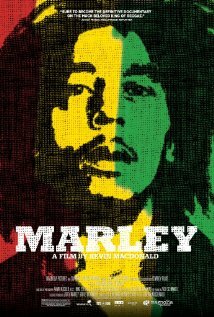 He shows the influence of the Rastafari movement and its beliefs on Marley, but he doesn't burden the film with them. They're just part of the picture. Marley follows Bob from the ghetto of Trench Town to Kingston, and all over the world. When he moved to the best part of Jamaica he told his sister, "I bring the ghetto uptown." Macdonald makes some deft decisions - he has sweeping shots of nature to expand our horizons. His montages - especially of Bob Marley - evoke the life and liveliness of the iconic figure. Macdonald composes his sequences with flair and vitality. Marley's father was white and his mother was black. He himself was effected by being a "half-caste." There is only one photo of his father in existence - the "general" astride a horse. After a rejection by his father and his father's family, Marley wrote a song. As the voice of Bob Marley sings "Cornerstone," Macdonald cuts back and forth between a white son Peter and Marley's dark half-sister, as they listen to the song in different settings. The editing by Dan Glendenning reveals conflict and nuance in the song. His half-sister then speaks about how Bob is now the remembered Marley and his father and his father's white family are forgotten. She is emotionally moved by the irony. There are piquant revelations. We initially may not know that a Cindy Breakspeare, a woman who was a girl friend of Bob, has a remarkable history. We later see her popular success in her youth. Some of the women in his life refer to Bob Marley's charm and shyness. Many were surprisingly supportive. His wife Rita tells about Bob calling her and her going to send other women away. "I became his Guardian Angel," she says. The fact that he had eleven children with seven different women may be startling, but equally surprising is the calm that several of the women exhibit. His daughter Cedella adds critical credibility about her father. She's a modern woman, who loves her father but was wounded by his competitive nature and impulsive life style. Macdonald also does brilliantly in composing Marley's ebbs and flows, and building drama. There are several gripping sequences. One is Bob Marley and his wife getting shot in 1976. Two days later Marley had his Smile Jamaica Concert in Kingston. Another is the One Love Peace Concert in Kingston, in 1978 when Marley brought the leaders of the two violent political factions on stage with him. And a third is the phenomenal Zimbabwe Independence Concert in 1980 before a crowd of more than 100,000, where Marley paid homage to his roots amidst tear gas chaos. Marley is a bittersweet paean to the life and vast influence of Bob Marley. He died of cancer in May, 1981, at the age of 36. Bob Marley was simple and soulful, and his life had universal reverberations. The movie Marley is as infectious and spiritual as one of his songs.